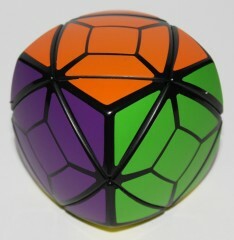 The Skewb is a vertex-turning cube puzzle. 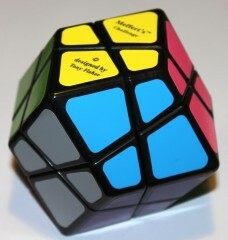 Whereas many puzzles look original but turn out to be but variants of some other puzzle such as the Rubiks Cube, the Skewb is genuinely different. And in fact it has itself spawned a family of variants. The Skewb is the only vertex-turning cube puzzle that doesn’t seem to suffer from inherent limitations of vertex-turning cubes. Since the set of possible rotations of a cube about opposite vertices is not a generating set for the isometries of the cube, vertex-turning puzzles have far fewer possible positions than might at first appear. 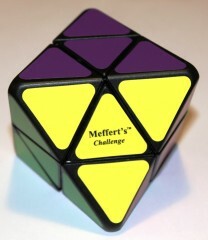 In other vertex-turning puzzles, such as the Dino Cube and Mosaic Cube, there is a very obvious limitation: it is not possible to flip an edge piece. There is only a single possible orientation in which any given edge piece can be placed in any given position, so you cannot place an edge piece where it ought to go without also orienting it correctly. The Skewb escapes this problem by the simple expedient of not having any edge pieces. In fact, the Skewb is not all that complicated a puzzle — at any rate, not in terms of the number of possible positions, or the complexity of algorithms you would need to memorise in order to solve it. It succumbs to a single commutator. And yet, somehow, it is hard to get your head around it. It’s hilarious to hand a Skewb over to someone who has never seen one before. 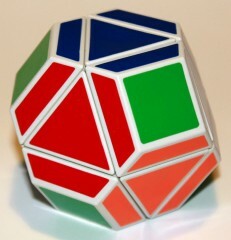 The average non-cuber is accustomed to puzzles that turn parallel with their faces, and can accommodate their worldview to puzzles that turn on a diagonal, but the Skewb, with its oblique cut, eludes them. They try several grips and several attempts at turning before finally succeeding in making a turn… and their first success doesn’t seem to make the second turn much easier. It is only after several minutes that the newly inducted Skewber really starts to get how the thing turns. And this is a nice metaphor for the problem of solving it. It isn’t a hard puzzle, yet it yields its secrets with great reluctance, and it is only after much thought and experimentation that insight and understanding begin to come. The raw facts of the matter are, the Skewb is a vertex-turning puzzle that is “deep-cut”. In fact it is cut right down the middle — along the plane between each opposite vertex. The implications of “deep-cut” are that pieces are, on average, affected by more operations. Take, for example, the Rubik’s Cube. It has 8 corner pieces that are affected by three kinds of turn each. For example, the top front right corner can be moved by rotating the top face, the front face or the right face. Rotations of any other face leave the top front right corner in place. The Rubiks Cube also has 12 edge pieces that are affected by two kinds of turn each. And it has six face centres that are unaffected by any turn. So we might say that a Rubik’s Cube pieces are affected by just under 2 operations each on average. Now the Skewb also have 8 corner pieces that are affected by three kinds of turn each. But it has no edge pieces; and its six face centres, far from being unaffected by any operations, are affected by 4 operations each. So on average, a Skewb piece is displaced by about 3 1/2 operations each. Or look at it this way. Each time you turn a face on a Rubik’s Cube, you displace 8 of its 26 pieces — less than a third. But each time you turn a face on a Skewb, you displace (or disorient) 7 of its 14 pieces — so exactly half. So it’s an easier puzzle, with fewer pieces, fewer positions, and fewer moves to solve it. But in some ways it is more challenging, because so much of it is messed up by each move. The Skewb Diamond puts a Skewb core inside an octahedron shell. Since the octohedron is the dual of the cube, we have a simple exchange of vertices for faces: every face piece on the Skewb becomes a corner piece on the Skewb Diamond, and every corner piece on the Skewb becomes a face piece on the Skewb Diamond. This subtly alters the puzzle in that it switches which pieces must be correctly oriented, and which pieces need not be. The Tetrakaidecahedron puts a Skewb core inside a truncated octahedron shell. This is essentially identical to the Skewb Diamond except that the vertices have been truncated. The Skewb Kite puts a Skewb core inside a rhombic dodecahedron shell. Every piece becomes a corner piece: what were face pieces on the Skewb become corner pieces for the order-4 vertices. What were corner pieces on the Skewb remain corner pieces, for the order-3 vertices. In terms of difficulty this is the ultimate Skewb variant, as every single piece must be oriented correctly. 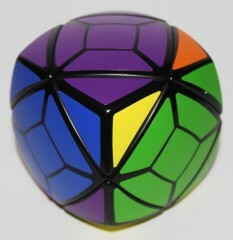 The Skewb Ultimate puts a Skewb core inside a regular dodecahedron. At first glance it looks imposing because of the irregular cut of its faces. But actually it is exactly equivalent to the Skewb Kite.